A young boy named Ted (Zac Efron), who lives in a town full of artificial everythings, goes on a quest to find a real life living tree to impress a girl he has a crush on. He seeks out the Once-ler (Ed Helms), who it is said knows where to find one. This draws the attention of powerful businessman Mr. O'Hare (Rob Riggle), who makes money selling fresh air. He is determined to stop Ted because real trees making fresh air for free will ruin him and his business. From Illumination Entertainment, the studio that brought the world "Despicable Me" and all of it sequels comes "The Lorax." This film is based on the Dr. Seuss children's book of the same name, a book we both remember being read as kids. This book has been adapted once before. Back in the 1970's, it was turned into a made-for-TV animated short. Here, the content of its very scant pages has been stretched into a feature length film, something neither the book nor the previous adaptation has the material to support. Where the book focuses on a conflict between the titular Lorax, voice here by Danny DeVito, and the Once-ler, voiced here by Ed Helms, this telling focuses more on a boy named Ted, voiced by Zac Efron, and his crush on a girl named Audrey, voiced by pop singer Taylor Swift, who shouldn't quit her day job. Ted wants nothing more than to have a real tree so he can impress Audrey and possibly get her to kiss him. In Thneedville, the town where they live, everything down to the last inch, the trees, the grass, all of it is fake!! The air is so polluted that the biggest product in town is bottled fresh air, a concept once explored in the movie "Spaceballs" that has now been taken beyond a one-off joke. To find a tree, Ted seeks out the Once-ler, who is said to know what happened to the trees in town and also might know the location of where to find one. 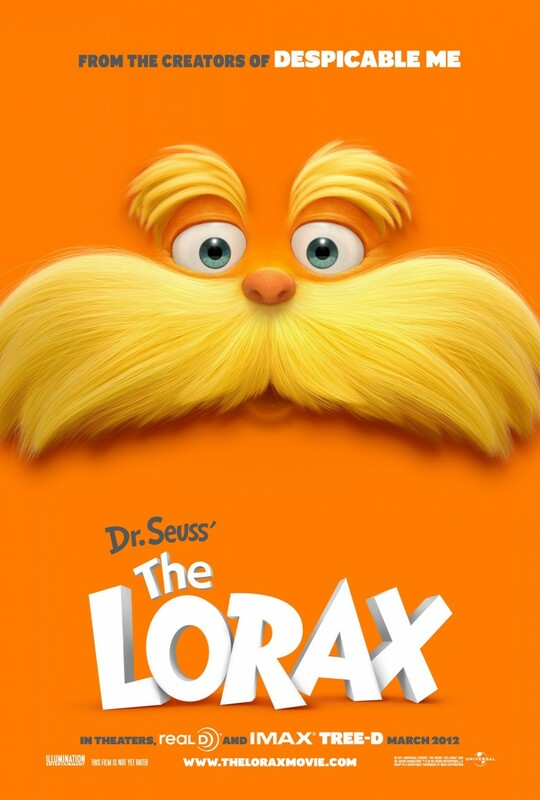 Once Ted actually finds the Once-ler, he learns about the Lorax, the creature who was a protector of the trees and nature before it was all destroyed. This flashback section contains the story from the book, and again, has been padded with filler and only feels included to make as much screen time as possible. There is some really cute animation in "The Lorax." All of the characters and objects look fantastically executed. The big floppy trees, the Lorax and his bushy mustache, it's a sea of vibrant colors that never seems to end. Most of the voice-over work is good, but like we said, Taylor Swift just doesn't cut it as an actress in the few project where we've seen her. Rob Riggle is both funny and menacing as Mr. O'Hare, and we totally buy Danny DeVito as the Lorax itself. Unfortunately, despite wanting to have a good message and be something poignant, the story just feels so trite. The filmmakers and writers strive to make the Once-ler, who is the villain in the book, a sympathetic character that was simply misguided in his pursuit of success and is now regretful of his actions. To us, it's hard to really tell if he only truly regrets putting himself out of business or if he really does care about his willful destruction of the trees in pursuit of money and fame and all that came with it. It is Mr. O'Hare who gets painted as the villain, though he is just trying to protect his business, much like the Once-ler was when he destroyed the trees. In the end, there is about the same amount of bad about "The Lorax" as there is good, which makes it a wash for us. It sacrifices most of its signature Dr. Seussian rhyming in exchange for lame dialogue we really don't give a hoot about or connect with on any level. In a world where "WALL-E" exists, this adaptation really should have tugged at the heartstrings of viewers and pounded its environmental message. If the filmmakers had stuck with the book and made a shorter, more well thought out film, it could have maximized compassion for nature and solidified the want to protect it on the part of the audience. This film is only occasionally fun, but it is also occasionally dull, too. Really, it's utterly mediocre.